This Vintage Upholstered Bar is our most popular design! Now you can have a bar to match your diner booth! 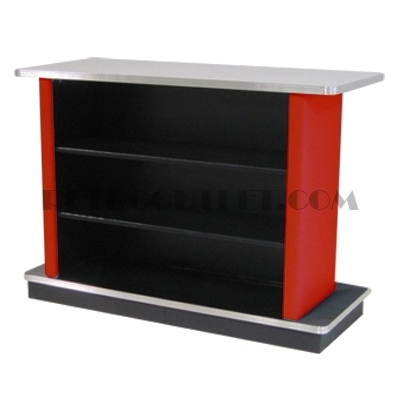 This is a beautifully upholstered five foot bar featuring adjustable open back shelves. The insert “V”, offered in your choice of contrasting color vinyls, completes the look. This upholstered Vintage Bar creates an intimate bar seating for 3 in front and 1 in back. A terrific addition to any gameroom, basement bar, or where ever you relax or entertain. The laminated bar top is available in 3 standard colors and trimmed out with 1.25″ real metal banding. Pick your vinyls to match your retro diner booth!